This owner operated property is the vacation spot for you and your Family. SANCTUARY FOUND... At the intersection of two very wide sparkling canals sits this lovely, four bedroom, two and half bathroom Spanish, Modern home. Endless water views delights in every direction - incredible sunsets from the master suite and from the screened-in porch just off the living room. Nice open floor plan, tile floors throughout. Professional tropical landscaping graces this 8000 square foot, parcel. After a long day of fishing, diving or shopping you can relax in the heated swimming pool. We have just recently added a second refrigerator and restaurant style icemaker. They are located in a large lockable storage area that can also be used to store your fishing equipment, dive gear, bicycles or any other items you may bring for your vacation. Winter months rent for $8350.00 per month all taxes included. Contact us for deals on two or month rentals. This property is owned and operated by Paul and Jessica Lebling. With local knowledge and great contacts the property is always clean and kept updated. Deal with an owner and not a Broker or Management company that may not return your calls. RATES --The below rates are estimates to give you a guideline. Actual rates can be found on our availability calendar when you enter your dates. Contact us for more details on the property or for offseason and multiple month rental discounts. Sept. --Nov. $5900.00 per month all taxes included. FOR MORE INFORMATION JUST SEND AN EMAIL AND WE WILL GET BACK TO YOU. MOST E-MAILS ARE ANSWERED WITHIN 12 HOURS. My wife Jessica our two kids and I love Islamorada and the Florida Keys. Living in Delaware at the Beach we get a chance in the off season to slip away a few times a year to take in all that Islamorada has to offer. Islamorada was just the perfect fit for us as we love all water sports, offshore and inshore fishing and just taking in the wild life. Many of our friends have vacationed with us and have been looking in the area for their own piece of paradise. This property is great for large families and groups of friends. Heated pool, deep water canals and many amenities to enjoy while on vacation. Very comfortable house but not over done so you can just sit back and relax. Heated pool, large storage for your fishing equipment or dive gear. Always kept updated and clean. Not over done so you can sit back and relax and enjoy all that the Florida Keys has to offer. The house is on the Bay Side the Ocean is less then a mile away. house sits on the coner of two deep canals, you also have a view of the open bay and great sunsets. we have it and it works , hope you never have to use it. this is the Florida Keys. I have only used it two in the past 15 years. drive way will park three cars. off street parking is free. Comcast wireless, "high speed blast"
Large kitchen refrigerator with ice maker and second refrigerator in the shortage area. Dish and utensil for entertain up-to 14 people. kept clean and uptown date. most kitchen utensils are changed every year. inside dining area will seat 8 along with seating for 4 to 6 more on the screened porch. Please do not leave any toys including pool toys. new pool deck, large screen porch off of living room and larger top deck off of kids room and master bedroom. This place is like home...only better. From the top of the line ammenities to the quality of care you receive! Owners Paul and Jessica really make you feel like you are a part of their extended family and really go above and beyond to make sure you have an awesome vacation. This will be our 4th stay and we can't wait to go back! We travelled to Islamorada for a fall wedding and this home was the perfect sanctuary. Close proximity to restaurants and shopping but perfectly situated in the neighborhood giving us the peace and quiet we were looking for. Long days by the pool (heated), fishing off the dock and a front row seat to some of the most beautiful sunsets I've ever seen. The ice machine was a plus keeping our beverages cold and ready all day! This home was beautifully maintained and the owners were very responsive to all of my questions and made some great suggestions for adventures and attractions in the area! 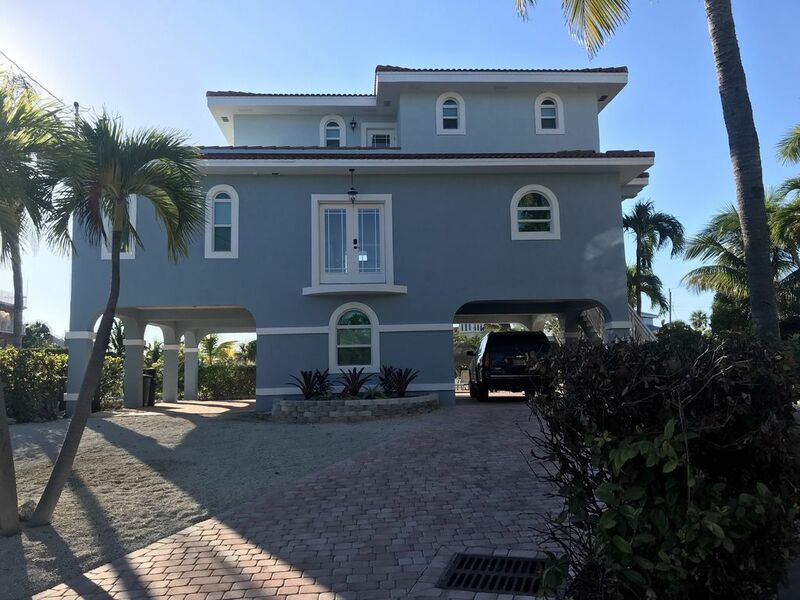 Islamorada has so much to offer but this house was the icing on the cake. We enjoyed it as a family of four but had so much room we look forward to bringing friends with us next time. We stayed at this home and loved it. My husband and myself 2 brothers and there wives and a friend of mine all came down from Georgia. Getting all these people to agree on anything is hard but we all loved it. Great home, nice heated pool, nice beach, nice area to dock the rental boat. This is a great location. Beautiful sunsets, clean canals, loved everything. Even my husband said he loved the storage area with the nice ice maker for all the fishing we did. Fishing reefs so close and a nice bay to put out my crab traps. The owners are heat to work with. Miss it already and I'm just driving home. I stayed at this property with my wife and son and all I can say is it was perfect. My wife wanted a pool... Check. My son wanted the beach... Check. And I needed a fishing friendly spot... We have a winner! The private beach was wonderful as we had the whole thing practically to ourselves. My 6 y/o son was able to practice his snorkeling as the water is quite shallow for a ways away from the beach. Once the weather changed and the cool wind blew from the north we were able to make a 5 minute drive to nearby Anne's Beach which faces south and is well protected from the northerly winds. Although the weather didn't cooperate much for fishing we had quick and easy access to the bay and ocean and the canal was full of fish for the days I could not make it out because of the wind. The heated pool was the relaxation destination after each day's activities. Outside of the water related activities my son enjoyed collecting hermit crabs each day, watching the many iguanas in the neighboring lot and collecting coconuts. I know it can be difficult finding the a property that is perfect for both the fisherman and the family but rest assured that this is indeed one of those properties. I would recommend without hesitation. Beautiful home on a quiet cul-de-sac with waterviews all around. We thoroughly enjoyed the heated pool, fishing and sunbathing at the community beach. The sunsets are gorgeous and the home is very comfortable with everything we needed to enjoy our vacation. Go shopping, diving or take a drive to Key West for the day. Relax and enjoy!!! It was difficult to come back to reality. This property is located in a very quite community on Lower Matecumbe Key mm 74 1/2 Islamorada. Just minutes from the heart of Islamorada so you will be close to many attractions. All advertised rates are cash or check amounts. Deposits can be paid on Pay Pal with no additional fees. Rental can be paid on Pay Pal, renter must contact owners for rates when paying on Pay Pal.